We are frequently asked how much it costs to remove a tree or grind a stump. Each tree and stump is different, therefore an arborist must see the tree to determine the cost. We can give you a general idea of what you might expect to pay. Remember you can contact us anytime to get a free quote. An average price for a large removal by Wellnitz Tree Care is around $1500, however we have done removals of humongous trees costing $10,000. Removal prices by Wellnitz Tree Care include removing all brush and logs from the property unless requested otherwise by the owner. Wellnitz Tree Care takes measures to minimize damage to turf and landscaping. With low bid companies there may be hidden costs in turf repair and damage to landscape. 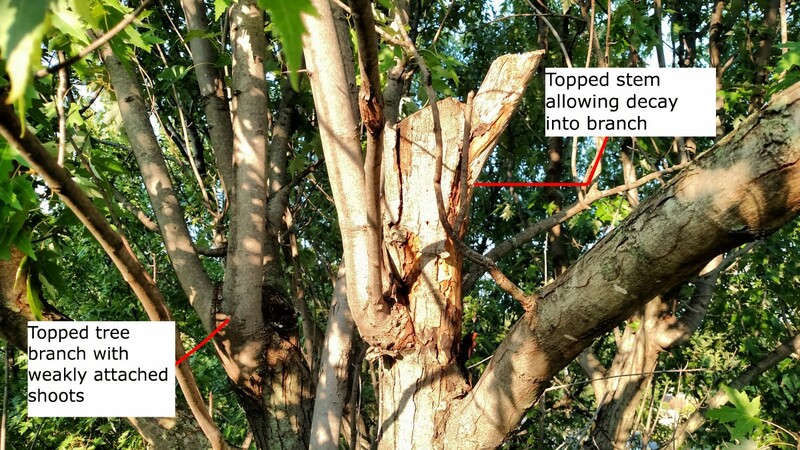 What Factors Determine Tree Removal Cost? The bigger the tree, the higher the cost. Can it be accessed by a truck or do we have to climb, and how far do we have to drag brush? Increased risk makes work slower which increases the cost. If there are objects under the tree that cannot be moved i.e. other trees, fence, house, etc. we must redirect falling branches which increases cost. The farther we must travel to reach the jobsite and haul off brush and logs the more the work will cost. Trees such as pines which grow straight are usually pretty easy to remove, big spreading trees such as oaks or maples usually cost a little more. Some trees require more time to prune properly than other trees. There are many different options when pruning a tree such as just raising over a sidewalk to a full maintenance prune. The more work we do, the more the cost will increase. Decayed trees are more dangerous and may cost more to remove. If you have a tree that is in decline call an arborist to have it inspected. It may save you money in the end. Fallen trees may cost less than standing trees, however if the tree fell on something, it could cost more to remove the tree without causing further damage to the object underneath. More equipment and type of equipment can increase the cost. Skid steer to move large logs. Crane to pick a tree from the backyard. Ropes, pulleys, and blocks to lower sections. Stump grinding is priced separate from removals because it requires different equipment. You can expect to pay anywhere from $80 to $350 or more for stump grinding based on the factors below. If you get multiple bids for tree work because you do not have a company that you trust and use regularly, be cautious about hiring the lowest bid, especially if it is much lower than other bids. This maple has previously been topped, increasing decay in branches and increasing the growth of weakly attached shoots. Click here to learn more. The company you hire is insured. Properly maintained trees increase property value but improperly maintained trees can decrease property value and create a liability for a home owner. Trees that are topped, have excessively large pruning wounds on the trunk, are lions tailed (removing too many interior branches), or have large dead branches can significantly reduce the value of the tree. Once trees are pruned improperly it may take years to correct if correction is even possible. Hiring a company without proper insurance opens you up to potential lawsuits and the possibly of getting stuck with the bill for any property damage. Click here to view a recent news story about an uninsured tree service. Remember the most expensive tree work often starts with the lowest bid! To Get a Free Estimate Contact Us! Lions-tailing – How to increase the likelihood of failure.